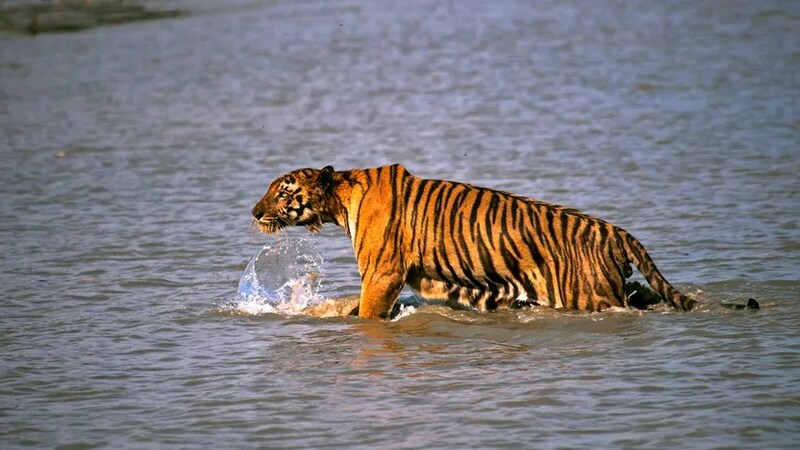 KOLKATA, India – A Bengal tiger snatched a man off a fishing boat in eastern India, dragging him away into a mangrove swamp as his children looked on in horror, the man’s son said Friday. The attack happened Thursday as Sushil Manjhi and his son and daughter were crab fishing in a stream in the Sunderbans National Park. The tiger leaped aboard the boat and clamped its jaws on Manjhi’s neck, said Sushil’s son, Jyotish. The tiger “quickly flung my father on his back and gave a giant leap before disappearing into the forest,” Jyotish said by telephone from his village of Lahiripur in West Bengal state. He said he and his sister tried to beat the animal with sticks and a knife, but the thrashing had no effect. His father was dragged away and was presumed dead. The attack underlines the difficult existence of millions of poor Indians who make a living by scavenging in forests and rivers, often at risk from wild predators. Many villagers fish for crabs in the Sunderbans — even though it’s illegal in the protected reserve — because they fetch a good price at markets in nearby towns. The national park is one of the largest reserves for the royal Bengal tiger. Thursday’s attack was the fourth deadly assault by a tiger this year in the Sunderbans, wildlife officials said. The big cat’s numbers have also dwindled because of rampant poaching to feed a flourishing market for tiger organs and bones in China.